Input is invited from anyone to help build up a full plan. We want all areas identified, provs and offices designated, toilet location, NAAFI/YMCA refreshment vans parking areas and identification of all the offices built on to the sides of the Hanger. 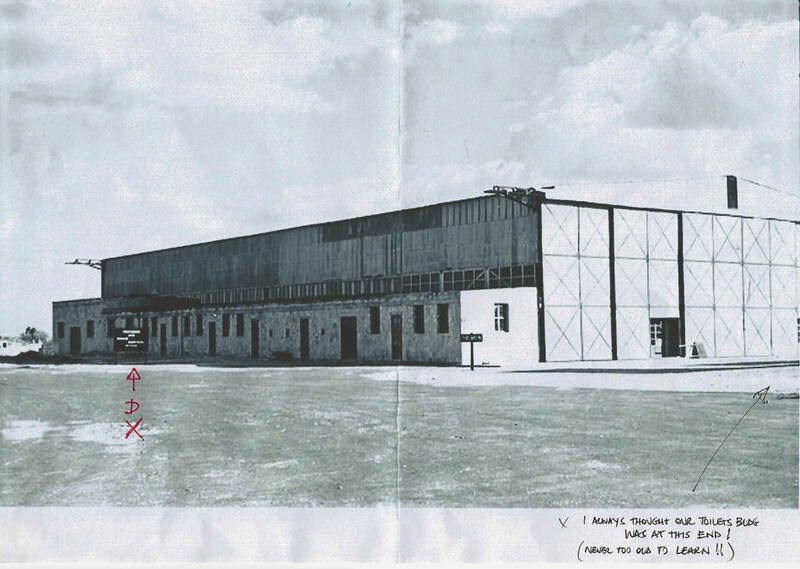 Jack Garry`s interest in reproducing a plan of the PSCO offices was sparked following the receipt in mid August 2010 of Colin Harrington`s extensive collection of photographs including a couple of the old PSCO Hanger. He immediately set about a search for thoughts from Ray Williams, Walter Hilsden, Colin Harrington, Les Archer and myself and it quickly transpired that most everybody had different thoughts on the layout, where they sat and even which way round the building was !! 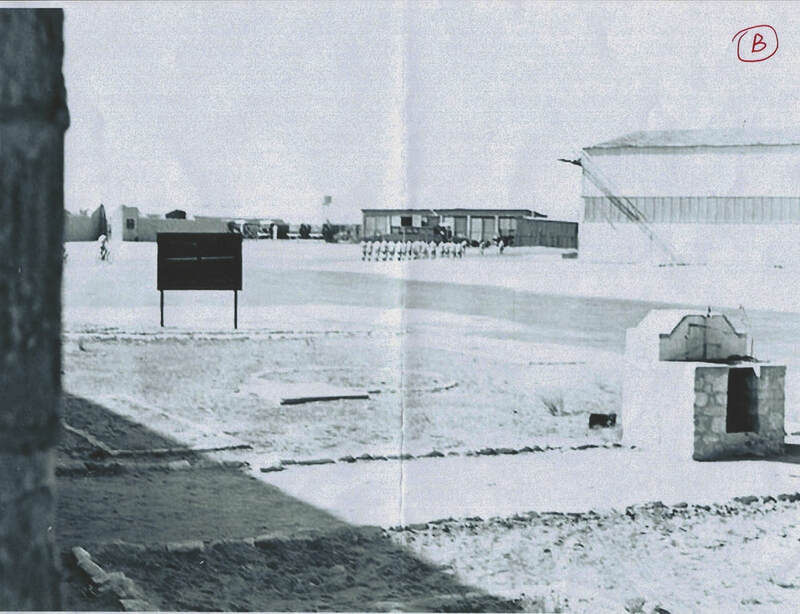 Picture taken from behind the notice board that can be seen in picture no 1 and shows a squad of airman marching back in the direction of the YMCA on their way back to their billets.......and a `composite` picture below from the same position. Alwyn stepped in with his interpretation of the layout with pointers showing where he took his pictures from the time when we were packing up all the records for return to Blighty. He was soon brought down to earth because Jack pointed out that Prov 3 would be at the other end !! Jack`s collage of queries is shown below but then Ray Williams came in with his layout plan which made things a little clearer. This balls-up prompted Jack to draw up this basic plan for others to add their thoughts to. 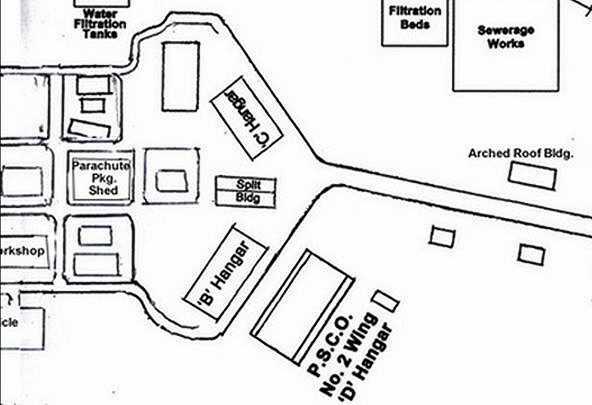 He noted that the first six offices on the left of this plan were admin - including Wing Co/ Adjutant/ Orderly Room/ Wing W/O etc. He does not recall what the other offices were for. He also remembered the toilet block saying ` we used to gather in this area having a smoke and waiting for a vacancy ! 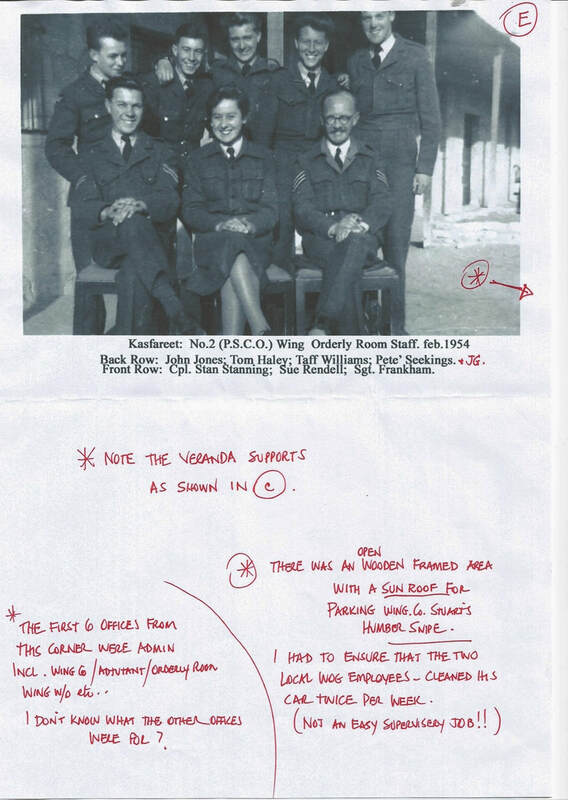 The following is an extract from Ray`s accompanying letter to Jack - " Well Jack, I got my thinking head and magnifying glass out to scan old photo`s and your plan (and Alwyn`s) of the PSCO Hanger and have used your template to fill in the interior of the building as I remember it. Alwyn`s map was great but I notice he placed 5 sections on that left hand side of his drawing, but based on his photo`s (copy attached) there were only 4 walled off areas. At the far end of the hanger where the outside toilets were is firstly the office where presumably that fire was extinguished, then my Prov 4 office , then the large office with two double doors and one single door,lastly was the area above which he was taking the pictures which he says were Prov 3 (with door in centre leading to the larger office-see photo). I have drawn my plan accordingly and would mention that I can`t remember any office furniture - desks - chairs etc on the right hand side of the plan so it was not used for stereotyped offices like the left hand side. I have drawn Prov 4 section as I can remember it there were about 16 `bods` sat at desks - mine has an X against it and faced a sergeant (hardly ever there ! ) and a corporal at their desks facing us. Behind them were two doors leading to the narrow Admin offices ( where I found the file on Guard Duties ! ) - it`s all interesting stuff isn`t it Jack ? - Just doing this project and thinking about it deeply made me feel as if I was back there again ! Colin`s comments- " as for the PSCO Hanger, luckily i have a photo of the end I was in. 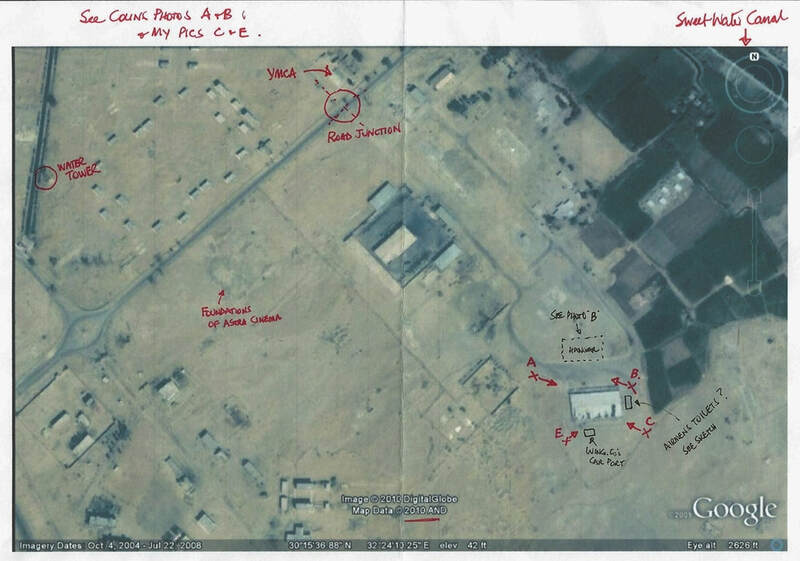 So I`ve included it in a bit of a diagram showing PSCO as I recall it ( using one of Jack`s Kasfareet camp plans) and made a few annotations. I hope they are of use. In our section there was an office occupied by F/O Scott - I think that`s it in the top left of Alwyn`s internal picture of the PSCO Offices on the website - I also think that`s the corner I was photographing from the `wire` when on Night Guard down by the Sweetwater Canal. I don`t remember Ray Williams corridor down the centre of the building anyway. We just seemed to walk through doorways ( Idon`t even remember there being doors) from one section to another. As you say, the photo doesn`t show any corridors - but it does show the doors I don`t remember. Don`t be afraid to tell me if I am still wrong. 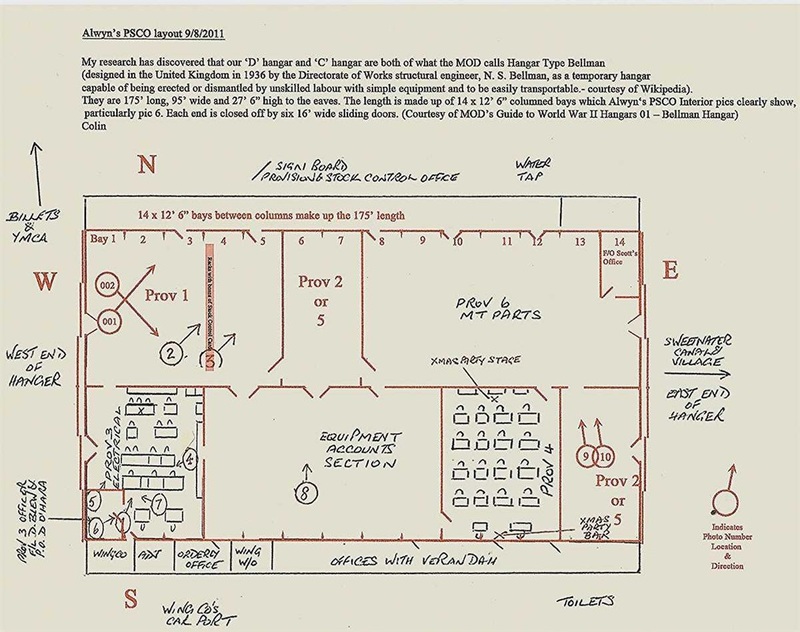 The red numbers on the plan indicate where the above slide show pictures were taken from and in which direction. 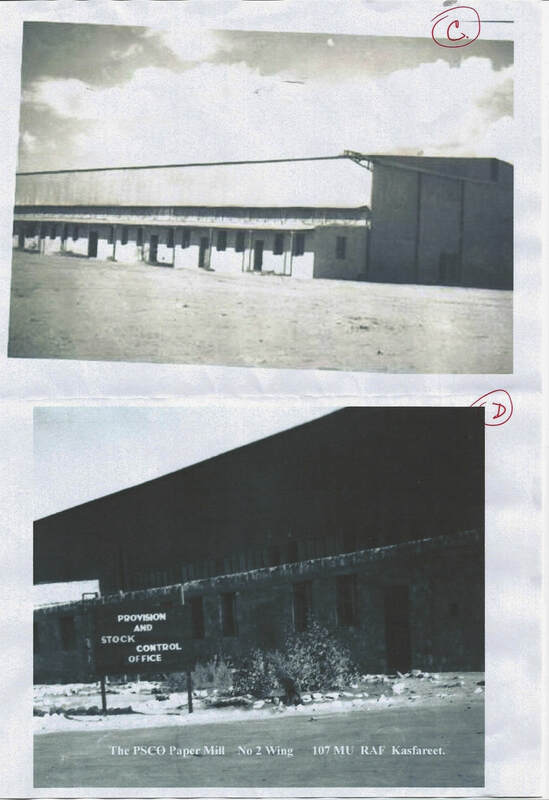 ps - pic 10 by Colin Harrington shows the row of offices down the south wall of the hanger. The Wingco`s office is at the far end opposite his car port. The bogs would have been to the left of Colin as he took the shot. One of the things that confused me previously was that I turned right out of the building when going to the bogs. It could well be that we went out of the prov then turned right and walked all the way down the centre of the hanger and went out of the door in the east of the hanger, turned right and went round the corner to the bogs. The only reason I can think of for this was that perhaps we were barred from going out of the west door in Prov 3 and turning left so that we did not disturb the wingco in his corner office so we had to take a longer walk....How does that sound ? Pete says - this is where I sat most of the day although I was in the cook-house when this pic was taken. All those boxes were full of cards which we looked at once a month. I think this pic is taken looking towards the corner of the walls separating Prov 3 and the other narrow unknown Prov. And this pic shows Pete Eva at his desk in Prov 1 ? This is about as far as we could go from Jack Aug 9 2011.